Decreased supply, high demand and low prices are among the encouraging developments in 2011 that give cause for optimism in 2012. Consumer purchase demand increased absent any outside incentives. As the active supply of homes for sale decreased dramatically, absorption rates improved to levels not seen since 2005. Unprecedented low interest rates and record housing affordability resulted in an 8.2 percent increase in home sales for the area. Consumers purchased 41,429 homes, up 8.2 percent from 2010 and—excluding 2009—the highest since 2006. Sellers listed 68,875 new homes on the market, down 15.8 percent from 2010 and the lowest level since 2002. 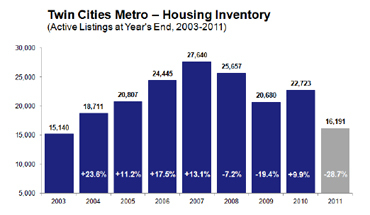 Inventory levels dropped 28.7 percent from 2010 and are at the lowest level in 8 years. Months supply of inventory—the time it would take to sell off all active properties—dropped 36.5 percent to 4.5 months. The median sales price fell 11.7 percent to $150,000. Precisely 50.0 percent of all closed sales were either foreclosures or short sales, up from 47.9 percent in 2010 and 48.9 percent in 2009. Distressed properties were the driving factor of home prices, selling for roughly 60 cents on the dollar compared to traditional homes. “Homeowners need to remember that median sales price does a better job of reflecting what’s going off the market as a whole than representing the home values in a given area—each area is unique,” said Cari Linn, President of the Minneapolis Area Association of REALTORS®. Improvements in the local economy will boost the Twin Cities real estate market in 2012. The outlook is positive: steady hiring, lessening layoffs and record low unemployment are all reasons the area continues to outperform the nation. For other year-end residential real estate statistics and for stand-alone December 2011 data, please visit www.mplsrealtor.com and www.spaar.com.